This is the third novel by Sujata Parashar in the series of “Pursuit”. The story is about relationships between men and women. The protagonists of the story are a woman named Sangeet and a handsome, young, talented ‘Avinash’, who goes through the havoc of a broken and disturbed marriage. Later ‘Sangeet’ tries to cope up with her life after moving away from her broken marriage, she and Avinash fall in love. Today many women face such scenarios in their lives amidst love, stress, betrayal, rejection, work and to top it up, family pressures. They definitely would be able to understand and empathize with Sangeet. This novel gives you an in depth, suggestive and sensitive overview into today’s relationships. The story gradually turns into love story, as generally love stories are not so smooth. 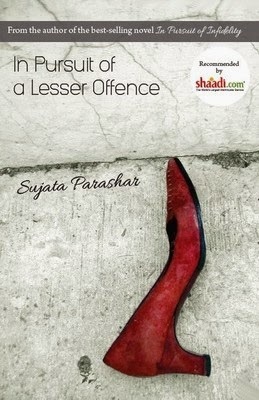 I thoroughly enjoyed reading ‘In Pursuit Of a Lesser Offence’. The climax was quite interesting with twists and turns. To unfold the same you need to read this book. The concept of the story is really nice and absorbing. This is a great achievement by the author for writing such a beautiful work of fiction. Even the climax of the story has been scripted well. The concept of Sperm donation and then Kanupriya’s views about marriage was something different, though this might not be appreciated by many Indian readers. Overall the book is good and very well expressed. The minor typos can be easily ignored by an engrossed reader. Overall if asked I would say...this is an exceptional job done by Author (Sujata Parashar) … I would give 4.5 stars to this book.